Essex has approximately 460 miles of coast comprised of mudflats, salt marshes, intertidal zones, off shore sand banks, 19 islands and much more. And then, there is its intense, expansive, wild, challenging beauty which activates and engages every sensory modality. Image courtesy of Marina Abramovic and Tin Drum. Thanks to The Serpentine Gallery, Press Page. While life on the Campus is buzzing with social encounters and opportunities for relationships, ultimately each student is on their own learning pathway grappling with their unique quest. I decided to generate a hologram of a single student sitting at a library desk engrossed in their quest for life-changing knowledge and project it on the pavement of the thoroughfare outside the iconic, New Brutalist building which accommodates the Albert Sloman Library. So, I looked around and asked “Where is the technology?” convinced that it must exist and I could use it to being forward my vision – sadly, the technology was not within my grasp. On the 23rd February, I went to The Serpentine Gallery, London to see Marina Abramovic, The Life, 2019. 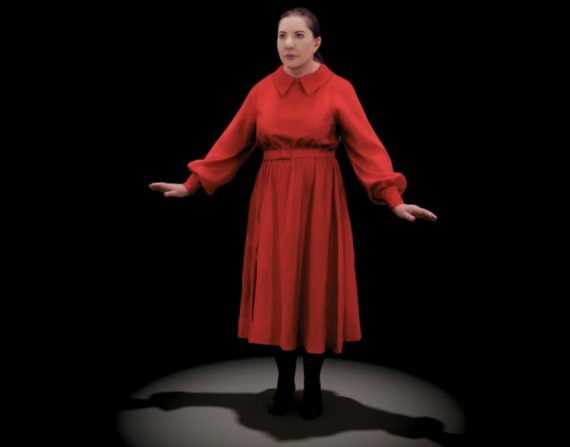 Using augmented reality which Abramovic and her team achieved the creation of a hologram. It took ten hours of footage from 36 moving cameras to generate the avatar and one minute of the performance. Visitors were greeted by assistants wearing white coats who relieved us of coats, bags, phones etc., and our eye-glasses. The clinical atmosphere generated a quiet, orderly, compliant queue. To compensate for the loss of our glasses, we were invited to try out different lenses which indicated which spatial computing device (Head mounted displays) we required. After calibrating the headsets, we were guided to a vacant spot along the circumference of a five-metre circle in the centre of the gallery space in which Abramovic’s avatar appeared. Wearing a belted, red dress with her dark hair pulled back into a pony-tail Abramovic walked slowly around and within the circle. She moved her hands and arms and brought them up to her head as though grappling with disturbing thoughts (my interpretation). At intervals her image dissolved, spectacularly into blue splinters of light some of which clung to her lower legs which was then all that could be see of her for a few seconds. Sometimes, she walked forwards and backwards in and out of the shards of light as though uncertain about whether to materialise or not – thereby be seen or not. Visitors could walk around Abramoivc’s avatar and so she could be seen from any 360 degree angle. Occasionally, she disappeared but we could see her shadow directly below her walking form. I loved the variety of reiteration of the sense of being and not being with others – or even with oneself. The Barcelona Pavilion was designed by Ludwig Mies van der Rohe (1886-1969) as the German National Pavilion for the Barcelona International Exhibition, 1929. 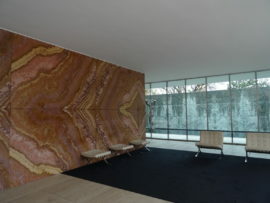 Built from glass, steel and four various kinds of stone (Roman travertine, green Alpine marble, ancient green marble from Greece and golden onyx from the Atlas Mountains), the originality in Mies van der Rohe’s use of materials is found in the ideal of modernity they expressed through the clarity and precision of their geometry and assembly. The Pavilion was dismantled after the Exhibition in 1930. However, due to its significance in Mies van der Rohe’s career and in 20th century architecture, it was rebuilt in 1986 on the original site. The materials Mies van der Rohe selected, together with his design, for the Pavilion convey a multi-sensory narrative which moves backwards and forwards along a timeline from ancient, through contemporary to future possibilities. Despite the tiled construction of the marble walls and floors, they appear to form seamless slices of a natural material which looks and feels harmonious and sateen. The patterns in the marble, including those formed by fossils held in suspended animation, are the result of the energetic-churning of the earth as it integrated disparate materials. The sometimes-delicate streams forming bold patterns (see Figure. 3) forged within the earth are further articulated by their subtle, harmonious, planetary colours and tones. Figure 2 is an image of an exterior space. 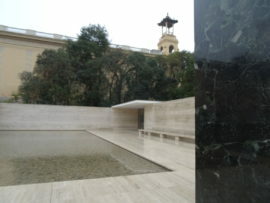 It was raining on the cold, February morning when I visited the Pavilion which meant I had the joy of experiencing the sound of rain diving forcefully into the surface tension of the water in the shallow pool reminiscent of a Japanese Zen garden (intended to imitate the intimate essence of nature). Beneath the 2/3 inches of water in the pool is a layer of regular sized, pale-grey stones. 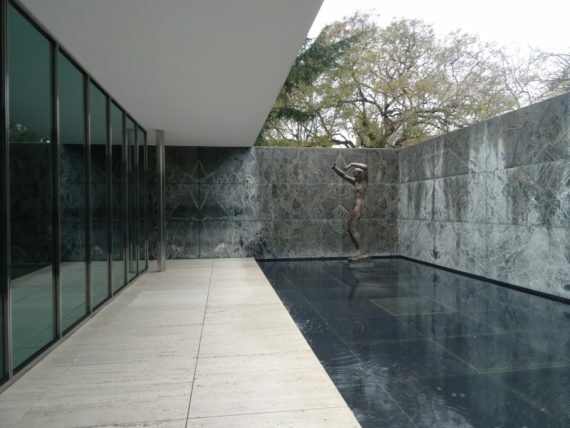 Mies van der Rohe used white marble – the result of the metamorphism of very pure limestone – to surround the Pavilion’s pool; it covers the floor, bench, walls and shelter (called a “hojo” in a Japanese Zen Garden – the residence of the chief monk of a monastery or temple). Thus, the exterior space creates a place in which people instinctively slip into quiet contemplation. These works comprise Phase 1 of a series: Infinite Potential. The influence for this series is architecture at Essex University. The project is an exercise in abstraction from the built environment and its surrounding landscape. 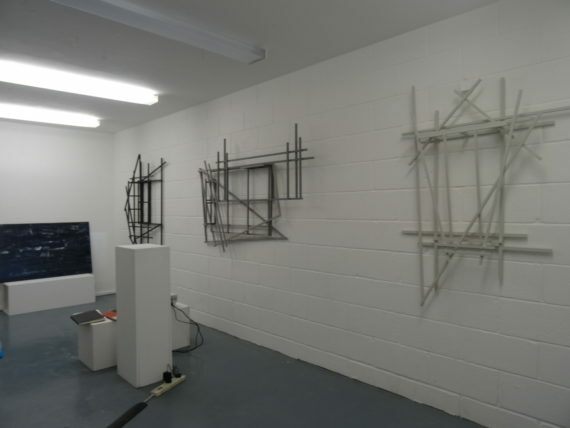 The images above demonstrate how I displayed the works in a rectangular room (the Installation Room at UOS). Purpose: curate and document Phase 1 of the project and begin Phase 2. Phase 2 begins with the introduction of light and moving images as a means of connecting the works; and expanding the works through space and time in unforeseen ways thereby making new work. Figure 1 shows three 1 metre high painted boards. The surfaces are painted with various spray paints combined to reference tarmac, concrete and stone; these paints are textured and grainy in appearance. They appear to be weathering and the colours are fading – this process references time passing. These boards are a response to the Brutalist buildings at Essex university. The markings on the boards reference the service roads and subterranean spaces beneath the University. The surface of the boards are overpainted with lines of various widths interacting to form geometrical shapes like road markings. To make the lines, I used the same chalk paint as used on the 3D constructions – drawings as seen in Figure 2 below; and stainless steel paint (made in Australia – contains stainless steel particles). The steel paint references the steel ventilation pipes found in the service areas beneath the university. The lines on the three boards in Figure 1 were painted as one piece. However, I remixed the original configuration thereby demonstrating additional potential relationships. Thus, although the marks on each board project a strong resemblance, if they are moved together so that they touch, the lines would not marry-up to form cohesive marks. There is sense though that a more cohesive configuration could be obtained by rotating the boards. Thus, the work motivates thought and action. A sense of potential change is implicit in the works throughout the series and the puzzle-like features of the boards in Figure 1 reiterate the theme of this series: Infinite Potential. I have returned to the feeling that the 3D constructions seen in Figure 2 are automated drawings. I have come to this definition based on how they were constructed i.e. I played with the relationships between the angles and lengths of timbers laying one piece on top of another and moved them until I felt the relationship was strong and aesthetically pleasing. The drawings are a response to the buildings both Brutalist and Contemporary at Essex university. As the drawings are built-up in layers, they are completely intercahangble. Each drawing is made-up of three autonomous layers which balance upon one another. Action: The drawings will function as a new ground upon, through and between which I will project moving images – play with light, time and space and thereby create new work. 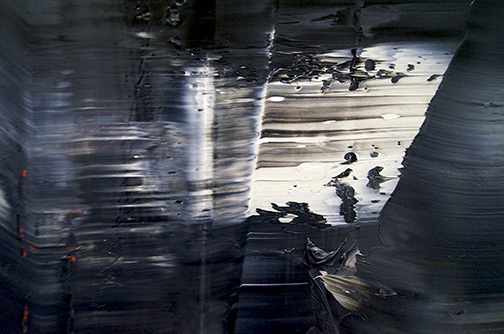 Figure 3 shows an oil painting influenced by Gerhard Richter’s style of painting abstract images by means of building-up many layers of paint. This painting is a response to Lake water agitated by a fountain. I decided to prop the painting up against the wall opposite the three boards which a respond to manufactured materials. The area which glows (bottom mid to right) is caused by the light from a projector. I superimposed an edited video of the lake on top of the painting thereby returning a sense of light and movement to the image. The video captured reflections of the building on the lake-side in the lake which was constantly agitated by the movements caused by a fountain. 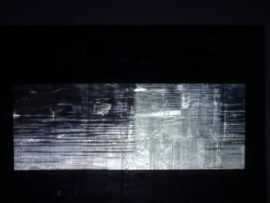 In introduction of moving images as equally key elements in the series marks a new and exciting Phase 2 of the project. Action: Audio – I have an audio recording of the sound of the water spraying out from the fountain which I intend to merge with the video. Do the drawings need to be present? These images demonstrate the impact of adding moving images/light to the works. 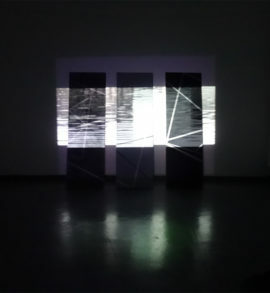 The video projected in these images is the same video I projected onto the oil painting (see Figure 3). I used this video as I particularly liked the way in which the ribbons of light streak across the 3D lined drawings. Hand-holding the projector means that I can manipulate the directions in which the streams of light fall (360 degrees). Meanwhile, the video contributes colours reflected off the surface of the lake-water and off the painting. Thus, video adds multiple dimensions to the work. An exercise in constructing, deconstructing and reorganising time and space. This image shows me experimenting last semester with the idea of inserting drawings, photographs and/or painted panels between sections of a 3D painting. The panels were painted with products and in colours which capture the irregular nature of tarmac (a response to the underground service area). I considered painting across the inserted panels with the lines corresponding to the lines on the construction beneath thereby reintroducing the continuity of the lines in the painting; and reinforcing a sense of layering and continuity through time and space in different dimensions. 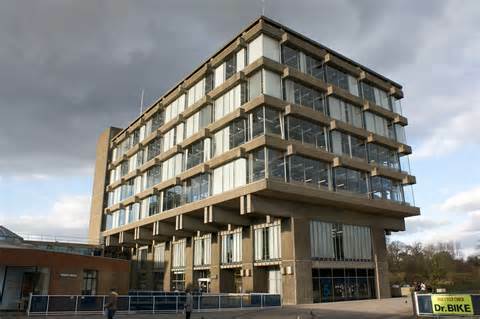 The monochrome photograph (see Fig.1 lower left) shows a surreal image of two buildings at Essex University. 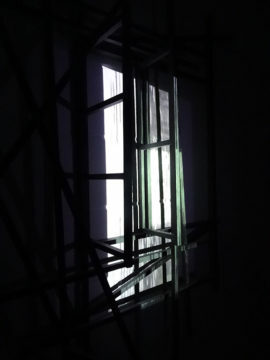 I took the photograph standing in the corner of a second storey room where two windows converged at a 90-degree angle. Thus, the image shows two buildings cropped and compressed. I consider the constructions to be 3D paintings in response to Brutalist buildings at Essex University (knowing the location need not be relevant to viewers). 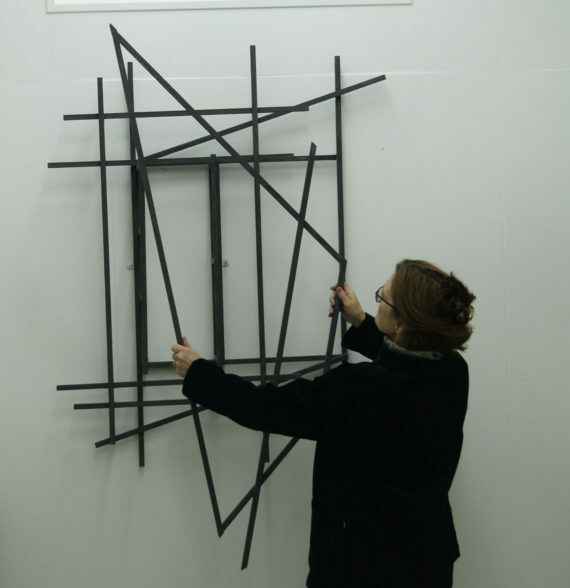 I used timber to produce geometrical constructs which were then painted in three shades of grey chalk paint (in response to concrete – the material used in the Brutalist buildings at Essex University). These constructions were not designed; each piece of timber was cut and fixed in relation to others. 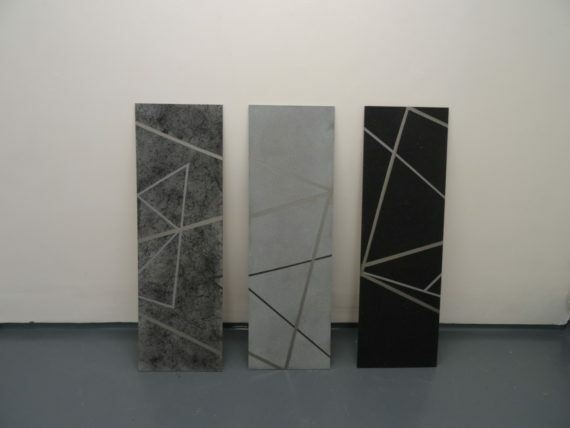 Each of the 3D paintings is made up of three autonomous layers painted in one of three shades of grey (Graphite, Anthracite and Flint – corresponding to natural materials). The layers of the three compositions are interchangeable – which introduces multiple additional possibilities including a sense of depth created by darker and lighter tones of white and black. 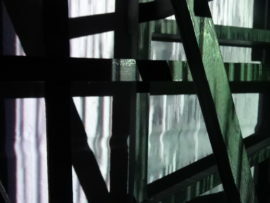 Currently, the first layer is prepared with mirror plates to be fixed to a wall and the subsequent layers are designed to balance on the first. However, all layers could be suspended from a ceiling, hinge out from walls and the corners of rooms. This exercise enabled me to analyse my conscious and other than conscious perceptions of time and space. I walked around and inside the buildings and through the landscape on the campus at Essex University thereby building-up sensory perceptions/memories. I then constructed a response to those sensory perceptions/memories in my studio. I found that the more I looked at photographs and images of architectural plans and drawings the more remote I felt from the environment I wanted to respond to and inhibited the act of making. However, when I simply made work – drawings and constructed layers using timber – with an open-mind I felt highly responsive to a motivating force which was only concerned with process of making and responding to what emerged. This exercise reinforced my belief that boundaries to our thinking about time and space, (represented by the timber lines) are perceptions (or fantasies/illusions) which we can control and change. I have the capacity to organise lines/boundaries to make new and satisfying associations and relationships (using individual and/or group criteria). 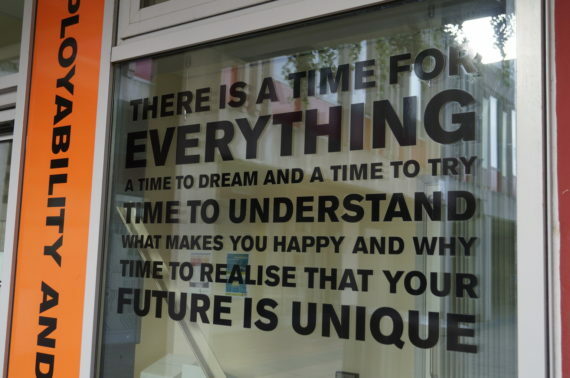 Thus, time and space is the stuff of infinite possibility (potential). Ultimately, understanding that Homo Sapiens can control time and space is about survival. The early paintings and drawings of architect Zaha Hadid – influenced by Russian painter and Theoretician Kazimir Malevich (1879 – 1935). Hadid’s use of perspective, colour contrasts and tone to emphasis 3D form and in particular shadows to extend and elongate the relationships between forms. Consideration of the spatial needs of individuals in urban environments (societies). This includes aesthetic considerations together with the relationships between ancient and contemporary buildings and ideas e.g. Rome. Julie Mehretu – influenced by Marxist and Situational Theorist Guy Debord (1931 – 1994) e.g. the idea of psychogeographies (a study of the effects of the environment on the behaviour and emotions of individuals or something that takes pedestrians off their predictable paths and jolts them into a new awareness of the urban landscape). Mehretu’s vision extrapolates from the local to the global. Use of layering e.g. images of architectural features of buildings overlaid with an abstract response thereby creating new spaces. The grey, 3D paintings as in Figure. 1 – a response to the build environment – could have colour videos projected into the spaces between the timber lines. The significance of the use of colour in the videos is that they reflect the changing colours in the ever changing landscape which interact with the built environment. In one video I have manipulated the colours to exacerbate their depth and contrast. The videos show layered moving images e.g. grasses moving in the wind overlaid by water in the lake rippling under the pressure of water projected at force from the fountain. 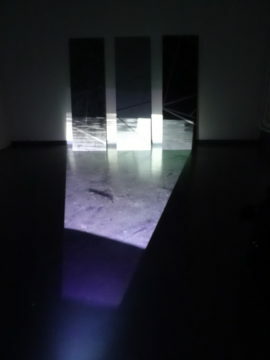 Thus, the projected moving images (the environment) interact with the static 3D paintings (representing the buildings) demonstrating that time and space offer infinite possibilities. 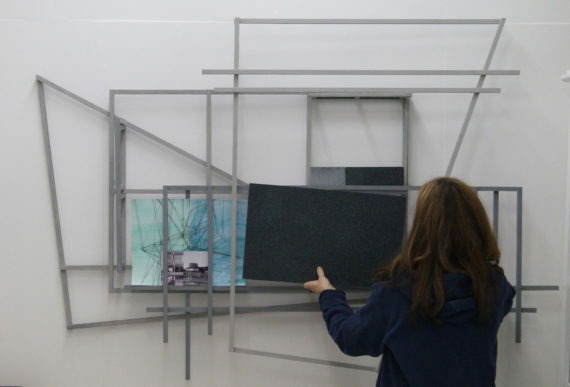 My work developed last semester from colour, 2D abstract paintings to include photographs taken via reflections – thereby abstracting new perspectives – layering videos, drawing developed to include a sense of perspective and 3D construction/painting. 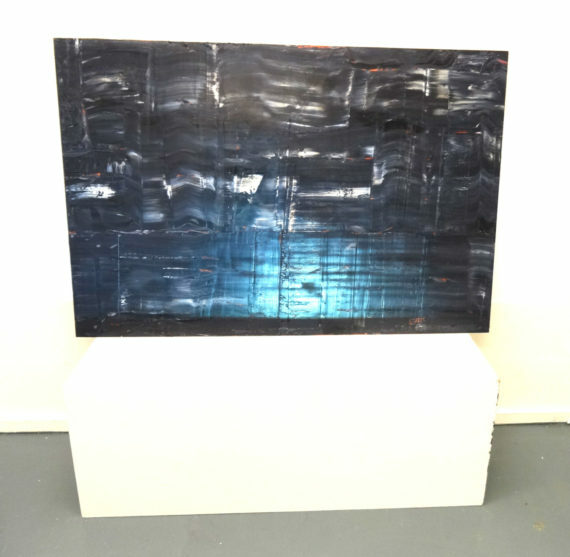 I intend to return to colour, 2D painting this semester and analyse the changes; including painting on aluminium panels. I also intend to consider combing video and a 3D assemblage (sculpture – using a limited number of materials and colour) so that the static 3D assemblage appears kinaesthetic. The apparent movements in time and space will be semi-illusory brought about by projecting moving images onto the 3D assemblage. Thus, the 3D assemblage will demonstrate the illusory nature of perception. Further to the thoughts I listed in my previous blog (20/01/17) which attempt to explain my response to visiting the campus of my first university – from a psychogeoraphical perspective – I decided to respond to those ideas in the form of a poem. This afternoon, I wrote the poem which follows in less than 10 minutes – like a stream of consciousness it is a collection of impressions of my early days as an undergraduate on the campus at Essex University in the mid 1980s. Propelling people into and out from secret warrens of knowledge. Not back yet, collected, just empty? The Hex – long queue, multiple voices – questions what and where and when and who? between fierce, protective Brutalist walls. containing numerous traces of bold ideas – hypothesis then theory. Reading at pace, analysis, vivid vocabulary. Banners and protests, boycotts and rallies – urgency. 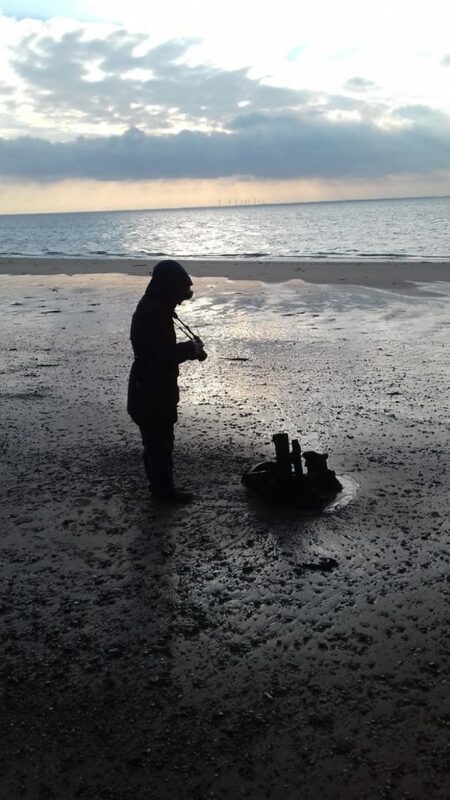 I am currently developing a range of works based on specific sections of the Essex coast made remarkable by geographical features - islands, saltmarshes, mudflats, creeks and estuaries; and architecture - industrial, Ministry of Defence, and Essex Coast vernacular.